Just because you are using a true RMS multimeter does not automatically mean you should always trust the readings of your measurements. In fact, most true RMS multimeters can only offer reliable readings under certain conditions. In this post, I will examine some of the pitfalls in RMS voltage measurements and show you some concrete examples on how RMS readings can sometimes be misleading. True RMS multimeters are noticeably more expensive than their non-RMS counterparts (i.e. average rectified multimeter). But before jumping onto the true RMS bandwagon, we need to fully understand some of the common limitations most true RMS meters have. As you can see later, whether or not an RMS meter gives accurate measurements is dependent on the task at hand. Voltage waveform: Most middle-range RMS multimeters will only give accurate readings when the AC waveform to be measured is symmetrical. As we will see later, asymmetrical waveforms can attribute to significant reading deviations from the true measurements. Crest factor of the waveform also affects the measurement accuracy. A typical RMS meter can only obtain accurate readings when crest factor is below 3 to 4. Signal frequency The frequency range of the signal to be measured tends to have a larger impact on RMS multimeters than none-RMS multimeters. Typically, RMS meters can only measure accurately when the waveform frequency is below a couple of kHz. Now, let us take a look at a couple of examples to see how true RMS meters perform in the real world. Typically, averaging multimeter is tuned specifically to measure sinusoidal voltages with frequency up to a few hundred Hertz (e.g. power main). As the waveform deviates from sinusoidal the measurement accuracy drops. For instance, the following oscilloscope image (RIGOL DS1052E) shows a typical waveform of a DIAC-triggered TRIAC dimmer circuit. When measured using a true RMS meter (BK 2709B) the voltage reading was 86.8V which is dead on compared to the oscilloscope measurement. When using a none-RMS meter (Craftsman 82339)the voltage reading changed to 65.6, which is almost 25% off the accurate measurement. Generally speaking, true RMS meters are well suited for electrician type of work. And true RMS meters have a high accuracy when the waveform to be measured is symmetrical. When measuring square wave, the situation is no longer as simple as before. Depending on the frequency and duty cycle, the RMS measurements can vary drastically. In general, the measurement error increases as the waveform frequency increases and the waveform duty cycle deviates further from 50%. The following table shows the readings of squarewave voltages of different duty cycles from a true RMS meter (BK Precision 2709B), an averaging meter (Craftsman 82339) and an oscilloscope (Rigol DS1052E). RMS (V): the measurement from a RMS meter. AVG (V): the measurement from an averaging meter. RMS (osc. V): the measurement from a DSO. RMS (osc) Err %: Oscilloscope RMS measurement error compared with the theoretical RMS value. As you can see, the measurements obtained using an oscilloscope tend to be the most accurate compared with theoretical values. The RMS measurements are reasonably accurate when the duty cycle of the waveform is around 50% and frequency is below 1000 Hz. But when the waveform frequency increases further the measurement accuracy drops significantly. The duty cycle affects the crest factor of the the waveform, and as duty cycle drifts further from the 50% level, the accuracy also decreases. Averaging readings are somewhat monotonic as frequency increases for a given duty cycle. The readings are hardly accurate except for a few odd-ball measurement points. So from the couple of experiments conducted above, we can clearly see how signal waveform and frequency affect the accuracy of RMS measurement. In the case where the signal waveform is unknown, a digital oscilloscope tends to give the most accurate measurement. This link on Agilent‘s website offers some more in-depth view on making accurate true RMS measurements. a digital type? I am interested in learning more about three phase used for single phase home use. 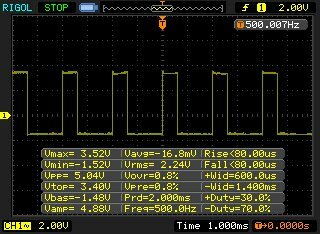 The waveform will be the same on either analog or digital scope, but you will need to calculate the RMS voltage on an analog scope yourself since most analog scopes do not have on-screen parameter displays. Thank you for the article. 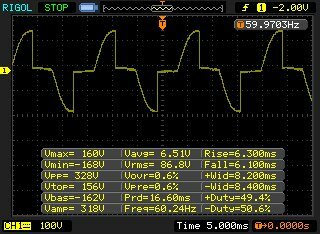 I have a digital oscilloscope, and I will be using it for measuring voltage since it has built in Vrms.